Each night, thousands of shelter beds in Los Angeles go unused, even though tens of thousands of people fall asleep outside. It's a mismatch that prompted KPCC to investigate conditions in shelters earlier this year. KPCC found that some people experiencing homelessness avoid shelters because they can be unsanitary and unsafe. Rats, roaches, bedbugs, and mold were just a few of the things found inside some shelters. Inspections and reports calling attention to the problems fell aside, largely because there was no standardized procedure for dealing with them. 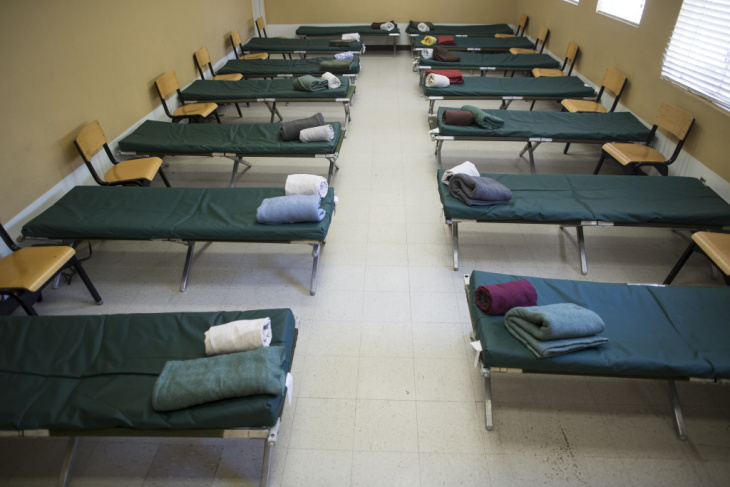 The proposal considered on Tuesday lays out a universal set of sanitary and operating standards for homeless shelters to follow. It would also provide for the hiring of four shelter-specific health inspectors to check that those standards are being followed. Historically, some of the difficulties and inefficiency in oversight can be attributed to L.A.'s decentralized shelter system. "Prior to Measure H, there was a great deal of fragmentation across interim housing facilities in L.A. County," said Phil Ansell, who directs L.A. County's Homeless Initiative. Measure H is the quarter-cent sales tax approved by voters in November 2016 that is expected to raise about $3.5 billion for homeless services over 10 years. "Measure H has created an opportunity to increase the total number of interim housing facilities and associated beds, and to establish a more integrated and coordinated system," Ansell said. Unlike many other regions, L.A. has a disparate network of shelter providers, many with their own unique funding streams. Depending on the shelter, that money could be from the government, from private donors, or some combination thereof. While many funders already require inspections, the lack of a countywide standard has meant some shelters have found themselves overwhelmed with audit paperwork from different funders and even from different departments within Los Angeles County. In some instances, shelter providers are each inspected by the health department, the mental health department, and the L.A. Homeless Services Authority, even though all of those agencies are technically different divisions of the same county government. "They didn't necessarily rely on each other's reports," said Stephanie Klasky-Gamer, president and CEO of the North Hollywood-based provider LA Family Housing. "It would be far more efficient for the scale of the work we're all doing out in the community to [standardize]. We all need to find greater efficiencies." Department of Public Health director Barbara Ferrer said at the Tuesday board meeting that shelter inspections will occur three times annually.